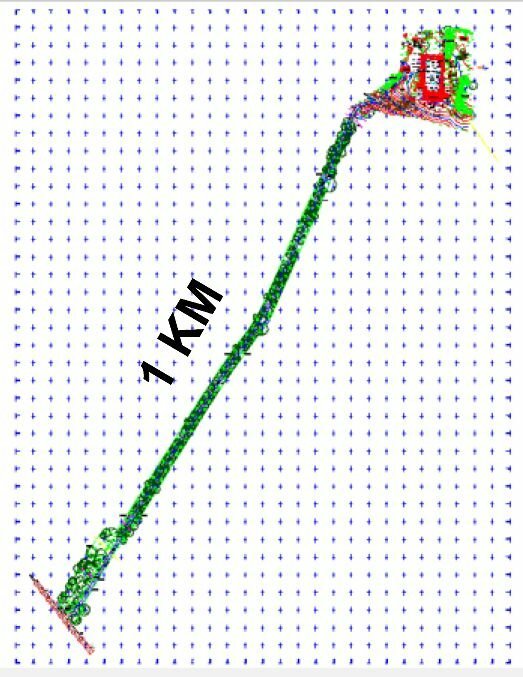 300 trees along 1km driveway was a test of patienceFloor plans, elevations, sections and a standard topographical survey were the order of the day for this Georgian property in rural Galway. As always the topographical survey was the starting point but with in excess of 300 trees to be surveyed on the 1km long driveway alone we were not long in rattling up in excess of 2600 points and had all data collected in just two days. A test of patience it proved to be with storm Timonthy blowing a gale around us for two days on site. A trip back to the office and 1 day later the topographical element of the survey was delivered to the client so they could get moving on some design elements of the project. To laser scan or not to laser scan was always the dilmena when deciding the approach for the elevations and floor plan element of the survey. 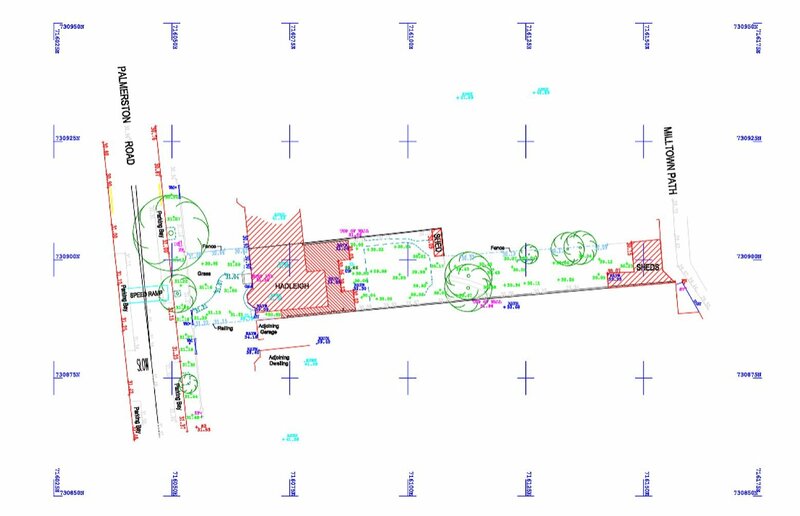 We decided that a few days longer on site with total station and MBS floor plan software was the best approach as it meant fewer days processing the data at the back end of the project with no dilution of the quality and the client received the finished drawings within a few days of us leaving site. With expierence crews were able to split the field work for the floor plans and elevations on site with just two men gathering all the data for the floor plans and elevations in a further 4 days on site. Both men working individually, one outside and one inside with MBS on a microsoft surface pro tablet. Back to the office and two days had all floor plans and elevations procesed and ready for delivery to the client. At MP Geomatics we like the old school aproach whereby the guys who survey the site proceess their own data. Our guys like it also as it gives them a much more rounded working experience and not just labelled as a data collector or CAD technician. 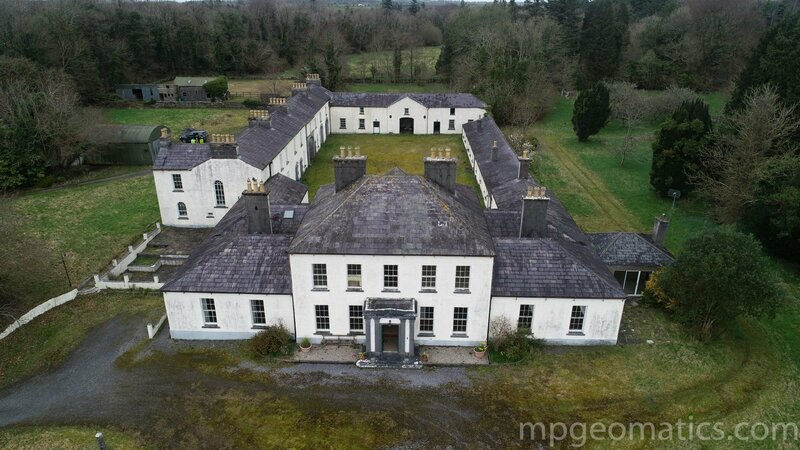 In addition to the floor plans, elevations, sections and topographical survey we also delivered a series of aerial photographs and video to the client. With special focus on the condition of the roof after a fire destroyed some of the property in 2009 these images proved as valuable as the survey data to the clients architect. "This was a challenging project for us but at same time a project which is right up our street and there is nothing we like more than getting stuck into floor plans and elevations. The cherry on the cake for the client was the delivery of the high quality aerial photographs. It helps that we are also fully qualified photographers with our photogrpahy services a high added value product for our clients." Mark Phelan Director MP Geomatics. Primary School Floor Plans, Elevations & Topo Survey. External elevation showing all glazing, panels, doors and windows tied to ITM grid and datumTASK: Survey a 300 pupil primary school in rural Ireland and do it during school term. 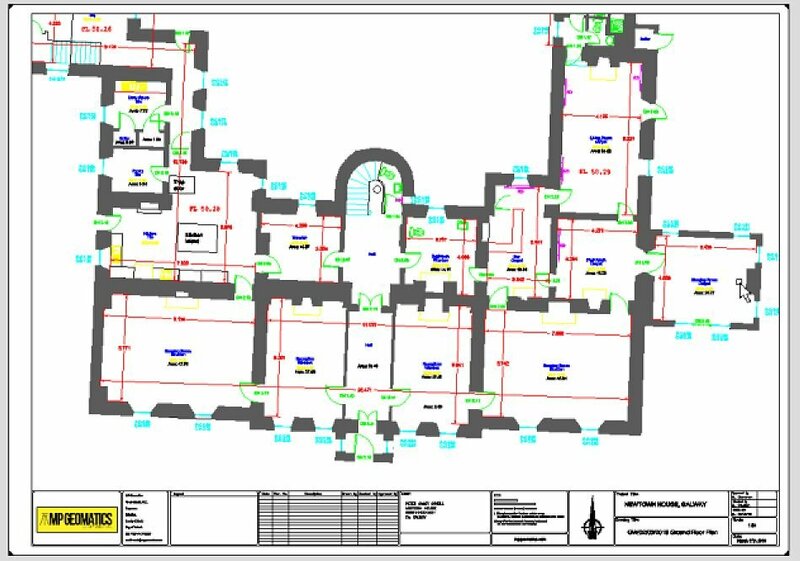 Deliverable: 2D floor plans and elevations along with detailed topographical survey of site. A difficult task at the best of times but given the weather that given week this rural primary school measured building survey pushed us to our limits. Day 1 in the rain was spent gathering all field data for the external topographical survey which we 99% conpleted with #Geomax Zentih 15 GPS with VRS link to Irish National Grid. Topographical survey showing levels, contours, boundaries, trees, adjoining buildings. manholes with invert levels as well as overhead lines both power and telecommunications. Day 2 and once again in the rain was spent working on the external elevations and given the deliverable specification traditional reflectorless Total Station coupled with MBS elevation software were the tools of choice for the job. The internal floor plans is where the project got somewhat tricky. As a fully functional school the only option for us to record the on site data was at the weekend. Day 3 in the rain saw the continuation of the external elevations while a second survey crew commenced the internal floor plans with MBS floor plan software. 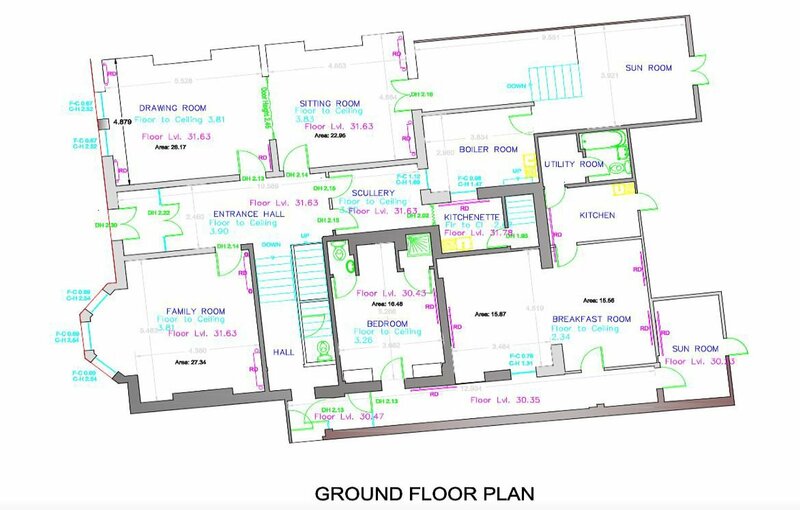 Internal floor plan showing room configurations, floor to celing heights, areas and all fixtures and fittings including windows, door swings, heating and all bathroom systems. A DXF of the external footprint of the building was the starting point for the internals with a combination of reflectorless total station and leica bluetooth disto linked to a Microsoft Go touchscreen tablet allowing us blast through the floor plan in 2 days. Day 4 and you guessed it more rain, saw us complete the field work wrapping up all elevations and floor plan data collection as well as opening all manholes on site to complete the external topographical survey. Day 4 was long and wet and in winter ultimately dark. We ended up working late into the evening to complete the field work ahead of the school opening again on Monday morning. A further 3 office based days completed all the CAD work resulting with the client getting delivery of the final cad drawings ( a total of 15 files) just 10 days after giving the go ahead for the project. Short winter days sometimes means getting creative. On this occasion we ended up recording external elevations in the dark with #geomax Zoom 50 Total Station bluetooth to tablet. Generator and lights to the rescue! Our task, measure a 5000 sq metre Georgian residence in a limited time window. Anytime we get an opportunity, and of course if the price is right, we can think of no better way to spend the day than carrying out measured building sureys with dimensionally correct floor plans and elevations as the deliverable. After a high profile Georgian property in the heart of Dublin was purchased for a price that us mere mortals could only dream about we were tasked with the job of measuring its tight site and dwelling on behalf of the new owners architect. We had a very limited time window with only a few hours per day and 3 days to complete the field work so it was all hands on deck to get the field work over the line. 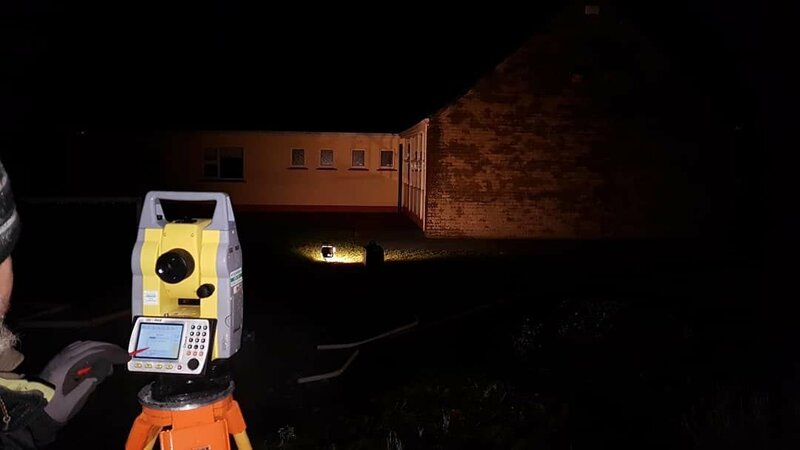 After establishing network control with #GEOMAX GPS we set about getting the fundamental but always the starting point of such a project, the outline topographical survey, knocked out in double quick time. Topographical Survey element of the projectThereafter it was a case of establishing control inside the buidling with a combination of #LEICA & #PENTAX total stations. Once the control was in the next step was to record a series of key room details on each floor to use as a base and as a self check as we handed the base DXF data over to our floor plan crew. 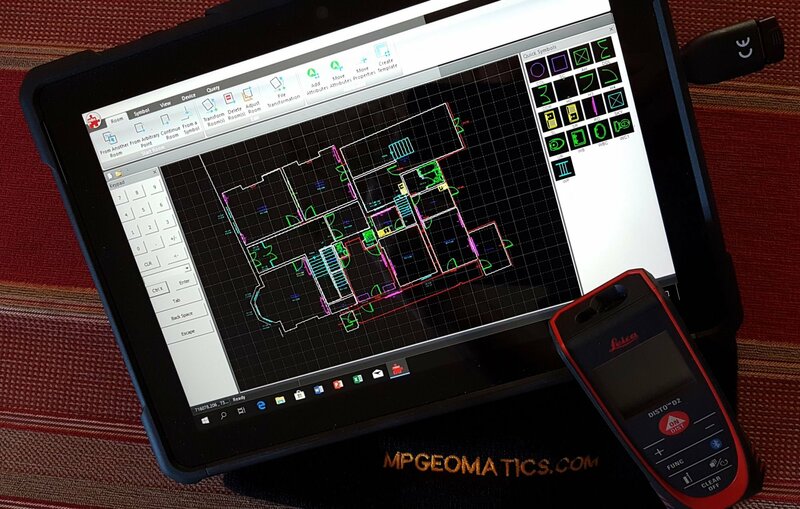 Enter one of our favourite pieces of kit and something we find invaluable when carrying out any survey indoors, #MBS floor plan and elevation software. The #MBS floor plan software allows us record on site details in real time adding rooms and all room furniture, doors windows etc giving us piece of mind as we go. MBS software + disto + Microsoft surface GO = Productive on site days. Once all the data was collected on site it was a case of exporting and producing final drawings that were Autocad compatible to the client to aid the design and planning process. Included in the final floor plans were all rooms, doors, windows, floor levels, floor to ceiling heights and room areas. In addition all fixed services were mapped including toilet and kitchen systems and radiators. Detailed floor plans formed the backbone of the projectAs well as detailed floor plans we were required to submit more simple contextual elevations of the front and rear of the property. Sometimes a difficult proceedure given the innacessability of major parts of the facade. Yet again that is where technology plays it part and in this case reflectorless total stations earned their keep allowing us shoot inaccessable points of the facade with the measurements yet again going straight to our MBS elevation software in real time. Contextual elevation showing the main elements of the facade. In all 2 site days and 2 office days were all that were needed to get the project across the line. Back in the old days, and the old days were not that long ago, this could have taken up to two weeks to complete.